Corrosive (usually soft) water can cause pipe to deteriorate and dissolve toxic metals into the drinking water. 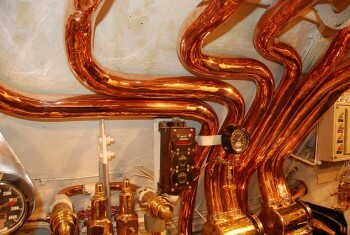 Refrigerated water and ice dispensers utilize a lot of copper pipe. The copper levels in ice and water can reach very high levels. Hot taps plumbed in at a sink are often plumbed with metal pipe and these can contain very elevated levels of metals such as copper from the plumbing lines. Waters containing elevated levels of sodium (salt) can corrode metal plumbing also. Sample 1st water out of the tap after the water has been sitting in the lines for at least 6 hours. This could be 1st thing in the morning before any water in the house has been run, or when a person gets home from work. This records what the levels of metals are after a short run time; answers the question regarding whether a short run time would reduce any metals that might possibly be present in the water.